You probably have questions about how to use Schema on your site. Me too. That’s why I’ve turned again to structured-data ace David Deering of Touch Point Digital Marketing for answers. Phil: What sorts of businesses simply have no use for Schema markup on their sites? David: I honestly think that every business has a use for structured data markup. The more that you can help search engines understand about your business, the better. 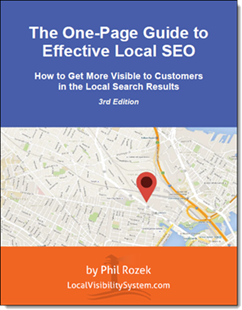 Phil: What kinds of “local” businesses have the most to gain by spending a little time on Schema markup – and why? David: Any business that sells a product or a service. So, I guess that would more or less describe every local business, really. Phil: As you know, I’ve said that one’s name / address / phone info is the by far the most important thing to mark up with Schema. What else – if anything – should the typical business mark up? David: Marking up the NAP is a great start, but it’s only the start. It tells search engines where you’re located, but it doesn’t tell them anything about what you do. So, I think that every local business should mark up what exactly they do or sell, whether it’s a product or a service. The more you can mark up and spell out for search engines, the better. Phil: Multiple locations’ NAP info on the same page: is that a problem, not a problem, or doesn’t matter? David: It’s not a problem at all. Schema.org has a means to handle situations like that. If a business has one or even several additional locations, you can use the “branchOf” or “subOrganization” properties to mark up each unique location. The key is to use a separate LocalBusiness schema type for each location. Phil: Besides marking up NAP with Schema, what’s your advice to most “local” business owners? David: Most local businesses only mark up their NAP, if anything at all, and that’s a huge mistake in my opinion. Not to sound like a broken record, but if you sell anything or offer any type of service, you can and should mark that up as well. By getting as specific as you can with your markups, you help search engines get a clear picture about what you offer, which can only help you. You can either spell it all out for them, or you can hope they understand what you do and sell. Obviously, it’s better to give them all of the information on a silver platter, which is what structured data markups can help you do. But it’s a golden opportunity that most businesses aren’t taking advantage of. Phil: Are there any ways business owners can use Schema to influence what shows up in the Knowledge Graph for their business? 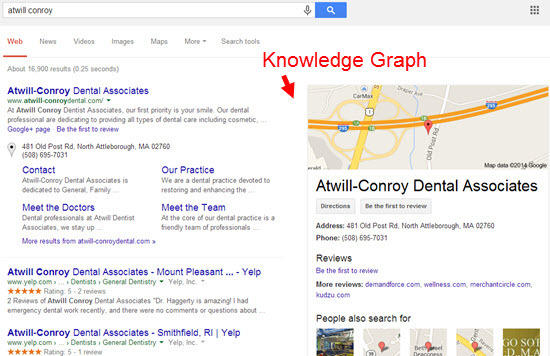 David: In itself, Schema markup won’t help a business’ information appear in the Knowledge Graph panel. Google uses a number of authoritative sources to gather the information that’s used in the Knowledge Graph. Schema.org markup can help, but Freebase, Wikipedia, and Google+ pages all play an even larger role. Phil: What type(s) of Schema do you deal with most often? David: Besides the typical NAP markup and product markups, most local businesses are interested in getting help with the rating markup, because it can generate those much sought-after stars in search results. Unfortunately, most do-it-yourselfers do it incorrectly and their markup has either technical errors or it doesn’t meet Google’s guidelines. Phil: Does a Productontology extension have to describe what your business is, or can it describe the main service a business offers? For example, in the last post you mentioned that you can use http://schema.org/Dentist plus http://www.productontology.org/id/Pediatric_dentistry. But “pediatric dentistry” doesn’t “tell” search engines what the practice itself is; pediatric dentistry is just the specialty of that dental office. David: Productontology, which was created by a team led by Martin Hepp, was created primarily to be used for products, as the name implies. And it can also be used to mark up services as well, since according to schema.org, a product can be tangible or intangible. But Productontology can also be used to specify other Schema types, and so that’s why we can use it along with business type markups. Phil: Besides the Structured Data Testing Tool, what tools do you use for any Schema-related work? David: Another good tool to use is Yandex’s structured data validator, which can be found at http://webmaster.yandex.com/microtest.xml. It’s a great tool to use in addition to Google’s, because Google’s Structured Data Testing Tool does not always pick up every markup error. And speaking of Google’s Structured Data Testing Tool, I should mention something very important that many people don’t realize: Just because you don’t see any error messages after testing your markup does not mean that your markup is error-free, it doesn’t mean that it meets Google’s guidelines for rich snippets, and it’s no guarantee that your rich snippets will appear in the SERPs. The testing tool is a nice tool to use, but it’s a basic tool, and it’s not designed to catch all technical errors and it definitely won’t tell you whether or not your markup meets Google’s guidelines. I use Google’s testing tool all the time because it is very helpful, but again, it’s just a basic tool. Don’t take the results as law. Phil: What’s the most common mistake people make in their markup? David: Most mistakes I see in markups are related to improper nesting and the improper use of various properties. Schema.org does include example markups for most of the markup types that local businesses would normally use, so it’s a good idea to try to follow those examples. I’d recommend creating the markup first, testing it out to make sure it’s good, then implement it on the site. Doing that can save a lot of time and headache. Phil: In what ways do some businesses use Schema as a spam technique? David: Well, because those rating stars are so desirable to have in the SERPs, some less-than-ethical businesses make up fake reviews and ratings and mark them up. Google has gotten better at sniffing those out, and most of those sites end up losing their rich snippets or never get them at all. I’ve seen other spam techniques, such as using the recipe markup for a product in order to get an image in the SERPs. But doing things like that isn’t worth it. Google can and will take manual action against a site that is being deceitful with their markups, and regaining their trust will be a long, hard road. So it’s best to stick to being ethical with things. Even if you don’t get rich snippets right now, your markups are still valuable because they help search engines understand your content much better. If you do get rich snippets, well that’s just an added bonus. Phil: Some people are concerned that if they botch up their Schema markup, Google will penalize them. How accurate is that? David: Personally, I’ve never seen a site get penalized for using a markup with errors. However, if Google believes that a site is attempting to manipulate things and is being deceitful with their markups, they will take action against that site. But for the most part, if a markup has errors, Google simply will not be able to understand it or use it. Phil: Many people think everything Google does is a grab for users’ data, and ultimately an effort to make more money off of ads. (Often I’m one of those people.) Just for the sake of argument, what role do you think Schema would play in that “scheme”? David: Some people believe that by marking up their content with structured data, it’ll make it easier for Google to “steal” their information and use it in the Knowledge Graph panel to answer questions, which in turn eliminates the need for users to visit the site. But not all of the webpages that Google pulls information from for Knowledge Graph answers are marked up with structured data. However, when Google does pull information from a webpage, it’s because it considers the website and page as having some authority on the topic, and it always links to the page. So, if Google views a website and webpage as having topical authority, well that’s definitely a good thing. And there’s also a good chance that users will click on the link to find out more, because Google can provide only so much information in the Knowledge Graph panel. It’s also been said that Google wants to go from being a search engine to an answer engine. By marking up your content, you help Google understand your content that much better, which in turn helps your webpages become “the answer” to relevant search queries. Phil: What advice do you have for webmasters and SEOs? David: Mark up as much content as you can. Make everything as clear as possible to search engines regarding what you do, sell, offer, or have written about. You may or may not get rich snippets for your markups right now, but the real value of the markups is that they help make things much clearer for search engines. Google and the others love structured data and want us to use it, so feed them what they love. And we all know how quickly Google changes things in the SERPs. One day nothing, the next day the local carousel, this new rich snippet, that new feature in the Knowledge Graph panel. We never know what Google is going to do or what new feature they’re going to add, but if you’ve marked up your site as thoroughly as possible with structured data, you’ll be in position to benefit from whatever happens next. Phil: Besides the Google Webmaster Forum and Schema.org’s confusing documentation, what are some resources you’d suggest? David: There’s a great semantic search marketing community on Google+. There are also a lot of very smart and helpful people in the structured data community, such as Aaron Bradley, Jarno van Driel, Martin Hepp and Thad Guidry, among several others. And of course, if you’re going to use structured data markups on your site, you want to be sure to go over Google’s guidelines for your particular markups so that they can qualify for rich snippets. Thanks to David, once again. If you don’t want to wrangle with Schema yourself, contact him. Any questions or stray thoughts? Leave a comment! Improper nesting is one of the biggest mistakes I see regularly, or excessively marking up a site e.g. schema person markup in a drop down navigation menu, which results in every page having that markup. I was wondering if you had an example of improper nesting? And what is the best way to check for this? Is is better to check for improper nesting by view page source, Google’s Structured Data tool, or the Yandex tool that David provided? I wish I had an example of improper nesting, but I don’t. David might! Thanks for the quick response, Phil! What type of SCHEMA property should be used to markup services offer? makesOffer? Hey Ben. I’m not clear on the question. Could you offer a specific example of the offer / service you’re trying to mark up? If your business sells services instead of products how do you mark that up? For instance, you’re a fortune teller and palm readings is one of your services. I saw David Deering’s comment on makes offer. Thank you. Nice article/interview – still amazing how many big sites and companies don’t use the schema markup.